During our research process we have found many problems whitch gave us some kind of signals which seemed to be totally illogical. These signals indicated that in the range of the finest measurements the evaluation of that seemingly strange results cannot be sufficiently done based on the philosophycal foundations of the current sciene. We felt that there should have been something wrong with the view - and this has to be made clear by searching for the real things to be used as base ideologies. When solving some measurement problems on the fields of virus (AIDS) and cancer research we got to the point that first of all we have to create a uniform philosophycal view which can be considered valid on macro and micro level as well. The research we done both theoretically and in the practice has shown such kind of surprising results which we do not want to keep as secret - instead we present the conclusions for you so that you may use them in your work as possible set of wiewpoints. This way we get a very strange, expanding one dimensional (and the outside is a singularity) sphere; all the points on its surface are of the same age with each other for the surface in question as a whole represents the same time, i.e. this shape that can be described by the means of the four dimensional dynamical geometry is the one dimensional time having equitemporial event horizon. In order to help the interpretation let us give this shape so called quantal spheres (for the figures could not have dynamics) and let us call this formulation positive time. This 'something' would be a 0 dimension point in the space if we had alredy have space! Let's develop this theory futher! The source of the time is the present; let's call it presentpoint! Any number of this kind of own time formulation can be put into the virtual (but rather mathematical - theoretical) nothing namely in the outher space (2nd hyperspace). These are subjective time-existants. This way we indicate that we do not consider the time to be nothing but rather it is considered physically existent, transcendent but not a fictious one. In order to develop something from the above written things we have to assume some axioms. Bessides the everlasting subjectivity there should be some kind of interaction between the time systems otherwise this timeset medium would dissapear. 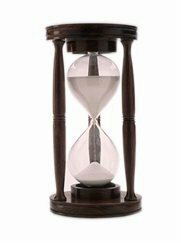 Here we should state that the time surfaces have no effect on each other but by reaching the present of the (massless) other time sources the called 'own present' will be represented somewhere and because of the expanding behavior they will thrust them. Let us name the growth; 'expand' and mark with 'E'. This is a dimensionless number, and acts as the base unit measurement of the Universe. .
Our time sources are subjective systems; they are concentric and spheric related to themselves. These facts do not lock out the relative displacements for they may realise and thrust each other thus the relative displacements may exist. They can approach to and depart from each others own time sources and even they can spin relative to each other. This way the relative velocity can be interpreted . Let's mark it with 'RV' which represents the movement factor expressed in 'E'. 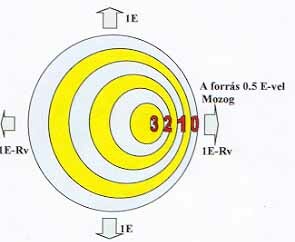 The relative rotation is marked by 'RR' which represents the number of spins (twists) that happen by moving along one RV unit. We have to apologize for using the notions (displacement, direction, velocity) lent from physics but our intencion is to make these things more clear. It is possible to abandon these but the explanation may grow much more complicated. Figure 4 shows the situacion when a positive time system moves by RV=0.5 relative to a remote time source located on the left hand side. We may observe a very interesting thing. In the direction of the movement the quantal time spheres happen to be more dense; on the opposite side they get rare. If we imagine that we enter into this system the quantal spheres will alvays be crossed in the 0,1,2,3,4 order (positive time). If we consider other possibilites namely the case of RV=1 we would experience that the examined time system will push in front of it a wall of infinite time density, so this case seems to be not important. But if we cross the misterious boundary (i.e. 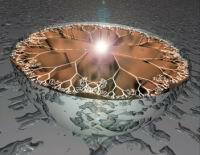 the expansion) a very strange phenomenon emerges in the time system just examined. The present source rushes in its own future becoming conical (relative to an other) and one more special and new thing will appear; the system of quantal spheres becomes dual (or trial, quadral etc.). Let us take a closer look on the above two figures. The left one progresses with the speed of expansion while the right one has the speed of E (xpansion) multiplied by 2 (RV=2). If we enter this one we may move even in the 4,3,2,1,0 etc. direction which means that this is a negative (!) time system. This is something rushing in its own future but has no mass at all. 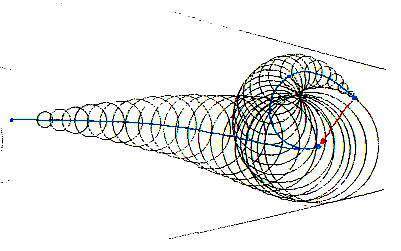 The criterii system of TACHION invented by physics in connection with the line - (This is an conical two dimension) displacement phenomenon named after Lamb is exactly fit on the above mentioned facts. Let's name the set of time systems discussed so far the Chaos. Here we cannot find find the space yet. These are the buds of the space; the space will be derived from the half spinned in the same time. (just the same as the farseeing physician Wheeler imagined as the only needed base element to build up everything - the elementon). The tachions whose RV is greater than E(xpand) do drift off by reaching the event horizons of other time systems - that movement can be traced using vectorial means - and having broken through the past time surface (which is unbreakable by the sources of slover motion) they will find dual time density states. This may lead to splitting the sources; the sources split to two parts begin separate own life in the negative (i.e. where the time passes in reserved fashion), spinned time system. The figures above show the events happening in the tachions - for the shake of clarity, simplified. We try to represent the natal (i.e. sufficiently parametered) 'date' which leads to the essential space derived from that strage time systems processes. Within this progression the plit branch rotating along a sharp bend rests (this will be the spot) and by reaching its own past surface it appears is its own past as a real time source. This process is in progress of an order tachion's twisted time; thus it does not result in a planar an imaginary octaeder (This is the spacetime diamond). The phenomenon is of cyclic and continuous nature. This formulation stabilizes itself so that in cannot be devastated and creates a special (having no space) six-source (+1 center tardion) fotino. That is something having a shape of (6) expanding spiraltoroid sphere which is essentially the only time dimension but derived from five sources in hexagonal (octahedron) simmetry, and creates on six places but not in the same time! 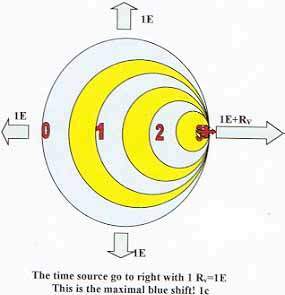 This the SPACETIME and this is also the first ENERGY quantum! This way we got a wave natured spacetime which satisfies the physical and mathematical criterii. Its survival is provided by its own infinite past. (This is an infinite time feedback). The dynamic phenomenon makes the conquest of the the Chaos with the speed of E(xpand) and by means of its very manipulative space it creates the possibility for the next stations to come into being. The space itself is energy as well, but unique for its supersymmetry does not repeat in the space. The further meetings result in new born spaces if the environmental parameters are sufficient to do so; the symmetry of them creates eight-sourced space centers; both the photinos belong here. 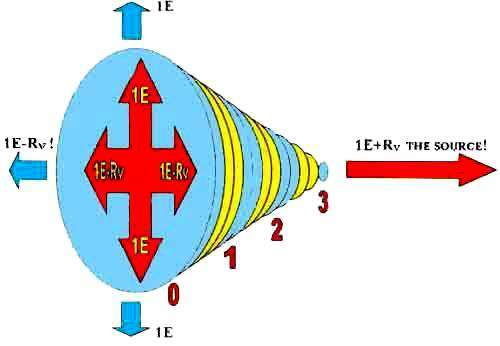 This is the only shape of the energy having dual behavior. It has the same half spin nature, i.e. it is the spacetime - which results in the accumulation of space layers due to the emanating speed of fotino; this way generating a time-wall in the direction motion. It is the cause of collidability so the particle like behavior. This is a unit portion of energy and not the photon wich is the set of photinos having the same orientation interpretation. The photino has no color. The color(ization) comes into life by the interaction with atoms and is derived from the so called white noise. (Adsorption and emission color spectrum). One source from the fotino's source se is alvais there in it own (1st) hyperspace. This is the cause of the speed of light. The fotinos are 7+1 dimensions. These are virtual dimensions. That existants can last only in the geometry of space for their simmetry is based on the twisted spacetime. Besides the meetig mentioned so far which involved only two tachions there may exist such kind of a meeting where three tachions meet. It results in a much more complicated supersymmetry system; the neutron comes into life. Due to the meetings an explosion like syptom takes shape which generates a fractal grows until the lifetime of its branches falls in the same range as the time-slip lifetime of the layers of timespace (luon) sieving everything in its own time. the fractal's time sources twisting left and right should be subjected to such kind of catastrophy so that the direct (turned face to face) same time branch relatives (male - female) will get into two separate times but into the same location. It causes the creation of an unbreakable time mirror on the first appearing surface of the particle having already been formulated. That's the reason why the particle is considered real and visible. By this time the population contains 740000 time sources; tis number acts as mean value characteristic of the neutron. There are many renegade sources in the particle's mainly corner icosaeder shaped spiral structured - course reviving and killing (drifting to the 1st hyperspace) the progress of neutron creation progress 1024 times per second. The particle's renatal cycle involves 5 and half renatal pulses whitch cover the radius of the radial spread of the phenomenon; thus this number of front waves travel through the swirling realm of devastating and reviving present sources. The neutron may split to proton and electron; thus we got the space and the four really essential stable and likely everlasting building blocks of the Universe. We can interpret the existants by means of a minimum 5 dimensional dynamic geometry - but one neutron really contains about 3/4 million of dimension sources! Our great physician, Denes Gabor told: "I'm waching but do not look anything" wen he tried to look into a particle using the newly discovered holographyc method. The french physician Charon has found inside the particle a time-space structure rushing towards its own past; this structure 'play its birth record' following a special coreography 1024 times (/sec). The particles are hollow inside; if they continously generate themselves from the internal tachyon system and if they do not contain anything else than TIME - the logical consequence is that their outer surface should not be any other than TIME! The microworld of the neutron is being continously in the creation state and its mirorring, whirling surface does not stop the curved spaces of the particle's sources because the vast amount of time sources composing a time population generate similar twisted spaces as the sace or/and energy does. Thus it is not the space itself which becomes curved in the environment of the material but the material generates twisted spaces instead (!!). It is a veli essential difference! These space layers are naturally subjected to and obey the expansion rule and they convey the existence of the particle even to the infinity by means of their twisted space layers. These are the GRAVITY WAVES. Such kind of waves are also generated by the space, light which means that they also possess of mass. This way the space, energy and material all got the wave nature; they organization makes a medium equipped with increassing amount of displacement information (for the motion in the environment of space sources leads to lue and red displacement). The sciene calls that medium; MORPHOGENETICAL SPACE. This "n" dimensional complex carries all the information of the Universe, for everything we call information are directly attached to the material structures. Now we have built up the essence. Everything involved in this are of wave nature (the corpuscular characteristics are off less importance). It is a logical system with many axiomatic elements and based on logically possible solutions. Considerable part of the declarations have already been proved deduced or measured, thus only some connecting element can be taken as new. What really new is: the picture representing a somewhat new image. Our research results enlightened that the basic idea is probably good; in the case of some macro level phenomenon the results make a sound base of the idea. These facts may open a new horizon on the fields of measurement and automation by making possible to integrate the real experimental results (called so far 'nonexistent' or 'paraphenomenon' because there was no related explanation) into sceptic, sometimes pessimistic and rigid world of the way the think; thus it may focus ous eyes on the real meaning of events and phenomenons.